As breeds go, the Belgian Malinois Dog could very well be the best guard and worker in the canine kingdom. Bred to be a herder, these dogs can take on a multitude of jobs, and they are the favorites among military and law enforcement personnel. Although the Belgian Malinois (pronounced MAL in wah) may look like a German Shepherd, they are nevertheless a separate breed. 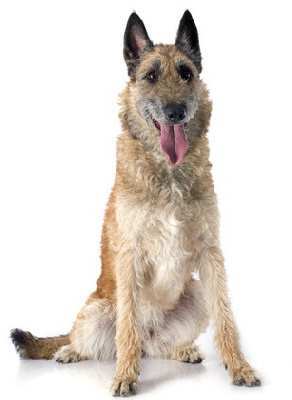 In fact, the Belgian Malinois is one of four Belgian Sheepdogs or Shepherds. 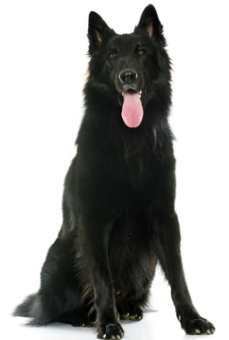 These four breeds include the Groenendael or Belgian Sheepdog, Laekenois, Tervuren and Malinois. Depending on the registry you consult, these four dogs could be either separate breeds or varieties of the same breed that differs only by color and texture of the hair. 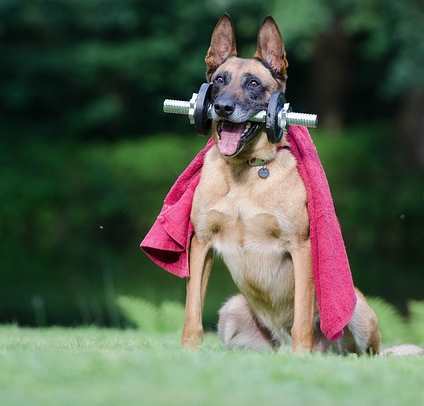 The Belgian Malinois Dog is a highly intelligent, very trainable dog, capable of performing a wide variety of tasks. Once used as a sheepdog, they are one of the breeds frequently used by the military and police. They are also used as assistance dogs, search and rescue, and narcotics and explosive dogs. Mals as they are often called, are hard-working, confident and with a strong desire to please their owners. The American Kennel Club registers each as a separate breed. They are happiest when they have a job to do. They belong to the working dog group and workers they are. Potential owners need to understand that the traits that make these dogs so good for military and police work may make them inappropriate for some families. They are highly energetic and need daily jobs and activities to keep them happy. Without this mental and physical exercise, they will find other things to occupy their time. Normally these activities can be very destructive. 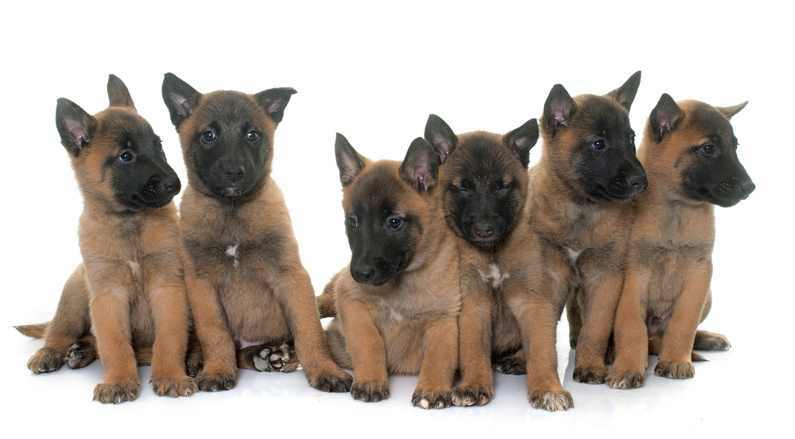 Like most dog breeds, all Belgian Malinois dogs vary in their love for children. Puppies that are introduced into the family and are raised side by side with the kids will do better than those who are rescued as adults. Children must be taught to be respectful of dogs and supervision is always required when children are young. As far as other dogs are concerned, they do fairly well and even better if they are raised with other pets. These dogs were originally designed to be herders and guardians and thus have a very high prey drive. This means they may decide to chase anything in their sight that moves: cars, animals, even children. A fenced in yard will keep your dog safe. Owners describe their Belgian Malinois Dog as loyal and devoted, excellent family pets, and fun to be around. They are alert, quick learners, and have a need to be busy all the time. Most tend to bond very strongly with one person. That said, potential new owners need to know that they have a high energy level which means they need regular exercise and daily activities to keep them happy. Socialization as a puppy is critical, and they need to be close to people throughout their life. If you are looking for a dog to snuggle up with as you watch television, look elsewhere as this won’t be the breed for you. The Belgian Malinois Dog is a very playful breed. They do best in a rural setting, a suburban area with a large fenced in lot, or if they live in the city, they need to have the opportunity for several long walks or jogs each day. These dogs do not make the best apartment dogs, though, as they do need plenty of outside time to run. They need both physical and mental stimulation and would do very well with people who love the great outdoors and who are willing to train and play with them regularly. They excel at agility, tracking, flyball, herding, showing, and obedience if you are interested in dog sports. The Belgian Malinois Dog Breed is ideal for Military Work. In the late 1800s, a group of people under the guidance of Professor A. Reul of the Cureghem Veterinary Medical School began to find foundation stock dogs from around Belgium, but most notably, in the cities of Groenendael, Malines, Laeken, and Tervuren. Collectively, these four “breeds” that developed were called Chien de Berger Belge. The dog breeds that were established in these locations ended up taking the name of the city from which they were developed. They were originally designed to be guarding, herding and flock guardians. 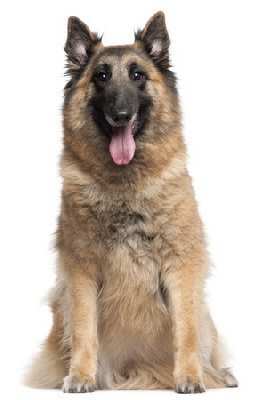 Eventually, in 1891, the first breed club, the Chien de Berger Belge (Belgian Shepherd Dog Club) was formed, wrote the standards, and began to register these dogs. The Belgian Malinois Dog specifically got its beginnings in the city of Malines where breeders drew up a standard for their own sheep-dogs and then gathered forty dogs who had similar looks and temperaments to be the foundation stock. At first, the dogs that were produced had three distinct coat types, short, long, and rough. These breeders worked hard to refine the breed, but their work was halted when the First World War broke out. These Malinois dogs were used in the war effort, and many lost their lives while performing their military duties that included artillery dogs, messengers, and ambulance cart dogs. They also served as Red Cross Dogs. The decades after the war and before World War II, the breed flourished. Many servicemen returning to the US, brought back a dog. Other European countries imported many dogs, and the breed continued to increase in popularity. By the time the Great Depression hit, they were one of the most popular breeds. However, breeding slowed down and with some breeds came to a halt as this endeavor was a luxury that most people could ill afford. 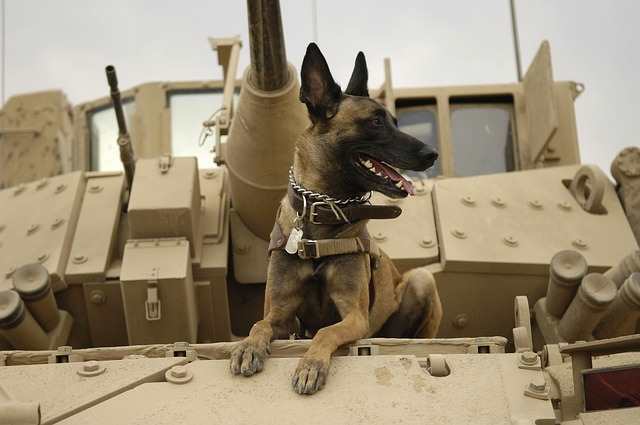 During World War II, the military again sought out Malinois dogs to help with the war effort. The breed was not nearly as hard hit as during the First World War. They were used as border patrol and scouts. Some were also used as Red Cross dogs. They were officially recognized in the United States by the American Kennel Club in 1959, and have been used ever since as both military and police work. They were first classified in the Miscellaneous Class and then moved to the Working Group. In 1983, the were moved again to the Herding Class. The American Secret Service also uses them to guard the White House because they determined them to be intelligent, agile, loyal, mobile and had an outstanding work effort. They have also been employed in the French RAID tactical unit of the French National Police. Germany, India, and Australia are more countries where these dogs are part of the military. Lastly, they are still the breed of choice in Belgium. The Belgian Malinois Dog has a double coat that consists of a short straight hard outer coat and a softer dense undercoat. Their coat is weather resistant. An interesting fact about their coat is that they have black tipping which means that there is a black tip on each strand of hair. They also have a black mask on their face and black ears. Shedding occurs throughout the year, but heavier shedding occurs during seasonal changes (Winter and Spring). Brushing is advised throughout the year but more frequently during these seasonal sheds. A once over brushing is enough throughout the year to keep the coat healthy and remove any stray dead hairs. During periods of heavy shedding, brushing several times a year will reduce the amount of hair you will find on your carpet or furniture. It is important to note that brushing a Malinois also means that the brush reaches the undercoat and all the dead hair that accumulates below the top coat. Without removing these loose hairs, the possibility of hot spots forming is high, and some Malinois do have very sensitive skin. Bathing, using a high-quality shampoo and conditioner should take place about every two months or so. If your dog gets especially muddy or dirty, you can bathe more frequently if you prefer. Often mud that sticks to the coat can be brushed away after it dries. Ears need to be checked periodically and cleaned regularly to remove wax and other debris. If the ear appears red or there is a noticeable odor, the ear may be infected. Infected ears need the attention of a veterinarian. Nails also need attention. If your dog spends much time on concrete or similar hard surfaces, their nails tend to file down naturally. However, if the only outside surface the dog encounters is grass, then you will need to clip the nails. Cutting right beyond the quick (blood vessel that runs half way up the nail) and then filing or grinding with a Dremel type tool will keep them looking their best. Clipping nails are not only a cosmetic thing, but short nails will protect the dog from accidentally getting them caught on something and pulling/tearing them. This is very painful to the dog, so you don’t want your working dog to encounter this discomfort. If you are squeamish about clipping your dog’s nails, your veterinarian will do it for you, or you can visit the local groomers. Often grooming shops will cut dog nails on a walk-in basis so you won’t need to make an appointment. The only other thing that all dogs need is attention to their teeth. Brushing a dog’s teeth will reduce the overall number of times you will need to get professional dental work done. 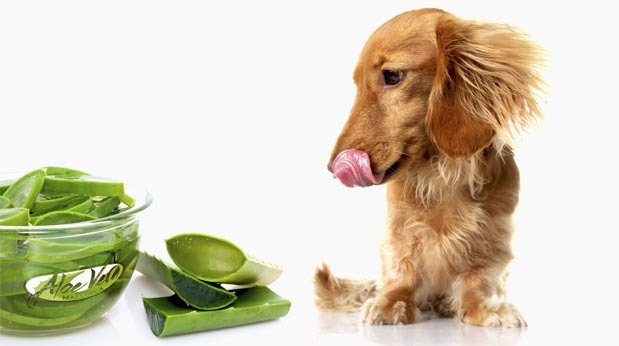 To keep your dog's teeth and gums healthy and clean, we recommend using aloe vera for dogs natural tooth gel. Find out more information about this great product HERE. A Belgian Malinois dog can be trained to do tricks. 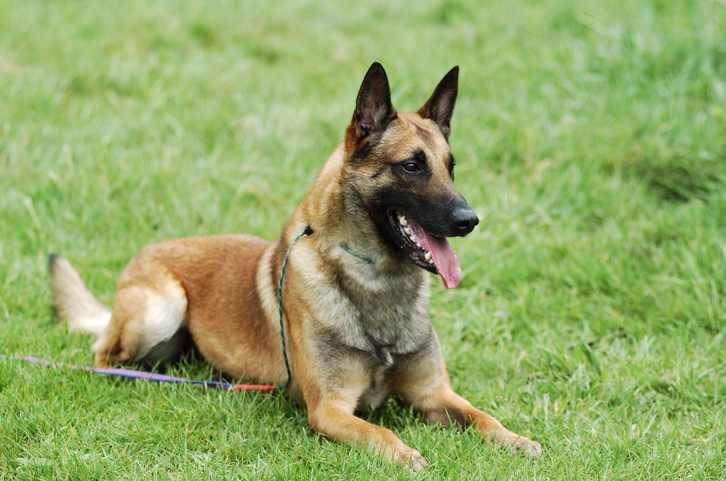 The Belgian Malinois Dog is a highly intelligent dog that responds well to training. In fact, these dogs need the daily stimulation of training to keep them happy. 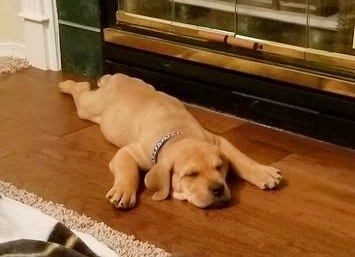 Training and Socialization should begin the day the puppy comes into the home. Socialization involves introducing the puppy to as many different people, animals, and situations as is comfortable without overwhelming him. Puppies will need to learn the house rules and routines and will feel more confident once they understand what is expected of them. House training is another task that should begin immediately. Before bringing your puppy home, it is advisable to decide where you want him to eliminate. A particular location in the yard is a good idea. Taking him to his spot about 15 minutes after he eats, right after he wakes up from a nap and after they drink water. You will also want to get into the habit of taking them to their spot before bed time to decrease the likelihood that he will need to go out in the middle of the night. Many people find that crate training is a fast and easy way to housebreak a puppy. Exercise pens (x-pens) are also useful for puppy training. The real key is to assure that the puppy does not have the full run of the house before he is mostly housebroken. Training should be a positive experience for both the dog and the human. They respond very well to treats and praise, so no harsh methods should ever be necessary or used. Most Malinois look at training as just another game they can play with their favorite person. Though easily trained, these dogs are not for everyone. They need an experienced owner willing to take the time each day to provide the training need and the mental stimulation to keep them happy. The Belgian Malinois makes an excellent guard dog. 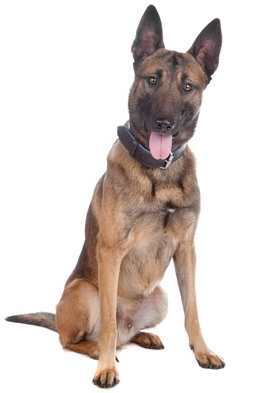 The Belgian Malinois dog would be a good choice someone in need of a guard dog. In fact, many owners would suggest that this is the best guard dog you can get. Known for their work with the military and law enforcement, there were also used as Russian Prison Dogs. They are smaller than German Shepherd and have a lighter build. They may be smaller, but their strength, energy, drive and work ethic are unsurpassed. Those dogs that are used in a professional setting undergo training known as Schutzhund training that prepares them to be a guard. Many individuals choose this breed to be a personal protection dog and if trained properly can be a force to be reckoned with. An intruder may think twice before entering a property guarded by a Belgian Malinois. 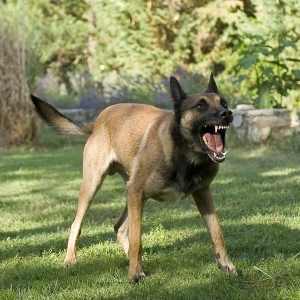 Here is a well-trained Belgian Malinois Dog in action. Belgian Malinois Dogs are generally a healthy breed with a lifespan of 12-14 years. The main genetic problems that have been identified in the breed is hip and elbow dysplasia, progressive retinal atrophy (PRA), pannus, cataracts, and epilepsy. Some tests can be performed on the breeding dogs that will help eliminate some of the problems so that is why you should always find a reputable breeder who cares about the health of hers as well as the puppies’ health. Some of these problems such as elbow dysplasia, for example, may develop due to too much strenuous exercise while still a young puppy. For this reason, training should be paced with plenty of rest times. For a natural remedy to help with Hip Dysplasia and Arthritis we recommend aloe vera for dogs - you can find more information hip dysplasia and arthritis HERE. Cairo, a Belgian Malinois Dog was a member of the Seal Team that played a critical role in the 2011 raid that took down, Osama Bin Laden.